Why is SR&ED time tracking important? When CRA comes in for a project review, this is one of the first things they will request. Tracking hours using excel sheets or other informal approaches can lead to incomplete representations of the time spent on a project, leaving dollars on the table and you’re already under-claimed submission susceptible for criticism by the CRA appointed SR&ED project reviewer. Rather, implementing a SR&ED time tracking software coupled with the right process can cut down the guesswork and put your claim on solid footing. There is a whole host of time tracking software built to track time and projects in general as well as other specialized software packages dedicated to solely tracking SR&ED activities. With all these types of SR&ED time tracking software out there what should you look for when selecting one that is right for you? I am not going to beat around the bush here. 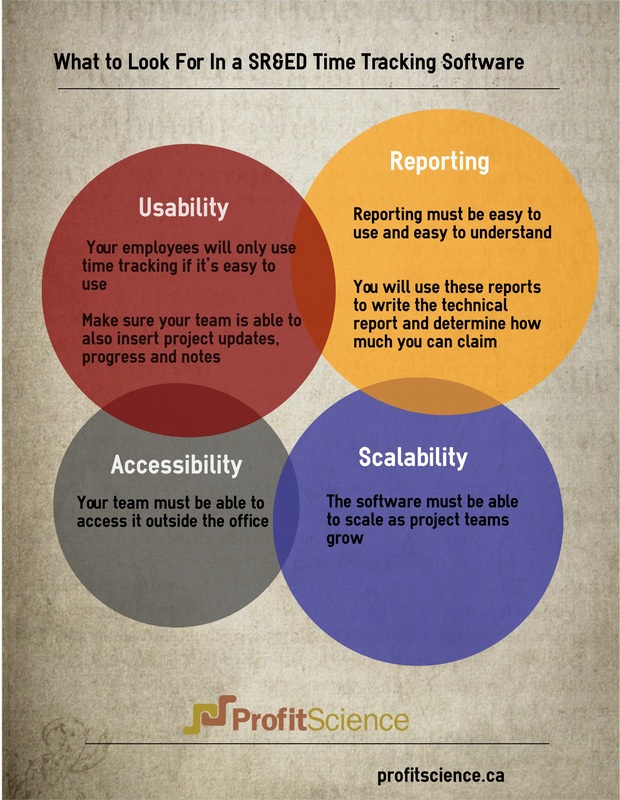 If the SR&ED time tracking software you choose is not easy to use, your team will not use it. Having software that allows your team to keep track of time in the most efficient way possible is critical. This aspect should be the most important feature you look at when determining what tracking software you will use. Your team members must be able to also write notes, comments as well as specific project updates. Having these comments tied to the time and date inserted into the software is also important. We will discuss this a later in this article. Work these days rarely happens just 9 to 5 and only in the office. Having software that is accessible to your team members outside the office is important. This way any work completed off hours or when your teammates are working from home can also kept track of. Projects often start with a small core of team members. As projects progress and activities surrounding the project grows, more team members may be added to during the life of the project. The SR&ED time tracking software you chose must be able to easily scale with the growth of your team. Determine your claim amount by knowing how much time your team member spent on your SR&ED eligible project. Pull and collate project updates, progress and comments. Most people have a natural dislike of having to report their hours, regardless of whatever software you choose. Regardless of which SR&ED time tracking software you use, if it is coupled with a timesheet submission process that’s too rigid, your engineers will abandon it. On the flip side, too light of a submission process and the reliability of the data becomes compromised. In our experience, we’ve found that weekly timesheets are sufficient for most engineers or software developers as they generally keep notes on what they worked on during the week and can adequately report the time spent on each task. Moreover, assigning a manager to review the that hours have been submitted by team members on a bi-weekly basis is a prudent step, especially in the first 6 weeks of implementing a time-tracking process as early on, some of your engineers or developers will not yet have formed the habit of reporting their hours. Finally, a quarterly, or in some warranted cases, monthly review with your SR&ED consultant and engineering leads should take place to discuss project eligibility on an on-going basis. For some clients, knowing early on in the fiscal year that a new project is likely eligible for the SR&ED tax credit can result in budgetary and hiring decisions for the associated engineering or development team. As discussed there are a host of software out there that will be able to be deployed across multiple organizations, projects and team. This guide will allow you to start determining which software will fit your needs. Does my Software Project Qualify for SR&ED? It is important for firms engaged in software development or interactive and digital media projects to fully understand the funding programs available to them. One such program is the Scientific Research and Experimental Development tax credit (SR&ED). Navigating the SR&ED waters can seem daunting, however if navigated properly, can provide your firm with extensive funding potential, with up to 74% of your project expenses returned to you. Even if you are fully aware of this SR&ED tax credit you might be asking yourself a very valid question; does my software project qualify for SR&ED? Having first mover advantage to service a given space with your software is irrelevant. When clients explain that “We’re the first ones to build a ‘x’ type of system for ‘y’ industry”, we explain that the SR&ED program reviewers couldn’t care less. The SR&ED program is based solely on technological advancement (regardless of the size of the advancement) and not commercial advancement. “We spent a lot of time and money on this project.” In and of itself, this is quite irrelevant. “No one has ever done this before”. See point 1. “My friend who built a relatively simple system was able to claim the SR&ED tax credit successfully”. Each claim is different and what may come across as simple on the outside can have significant technological complexity. Even if a colleague has successfully claimed what seems to be a bogus SR&ED claim, they will get caught eventually and when they do dealing with CRA will be a costly, time consuming and painful process. Next, and closely related to the previous point, one shouldn’t assume that because your in-house built system offers similar functionality to that of a competitors system that you are ineligible for the SR&ED program. Remember that if the knowledge base required to achieve the same functionality or performance of a competing system is not available in the public domain or considered part of the routine knowledge base of an expert level software developer, your project may still very well be eligible. Identifying platforms, methodologies or techniques that were applied to your project but would considered “routine” engineering by expert level practitioners. Did your work require experimental development iterations that went beyond routine software development? Did your development work achieve a systemic advancement such as the integration of two platforms not designed to communicate with one another? What about performance metrics beyond published capabilities of integrated platforms? If you can answer points 2 or 3 in the affirmative, isolate the work associated with these advances in your knowledge base to form the basis of your SR&ED projects. Next, you’ll need to demonstrate how the advancement came about. Is Trial and Error Eligible? Your work was documented. Note that software code with comments in the source code or check-in logs count, but as a bare minimum. Each development iteration was based on an informal hypothesis. Ideally you would have some documentation discussing notable potential solutions and explaining why a chosen path was selected. Atlassian’s Confluence is an excellent platform to capture this type of data. Some form of time tracking system or reasonable estimation strategy (extrapolated from data such as calendar bookings, emails, etc.) was used to determine the number of hours spent on the project. Determining and demonstrating how you were able to extend your company’s knowledge base beyond the publicly available knowledge base is the key to determining whether your software project qualifies for the SR&ED tax credit. For further details book a free consult with our Montreal based SR&ED consultants will assess your projects and discuss your options. The Ontario provincial government announced the following changes in their latest provincial budget. These changes will mainly affect what are called “top up” programs. Credits for these programs are usually claimed in conjunction with the SR&ED tax program. One of the more significant of Ontario’s Provincial “Top Up” program is called the the Ontario Research and Development Tax Credit (ORDTC). It’s important to note that these changes will affect eligible SR&ED projects and expenses generated or incurred in the years that end on or after the 1st of June 2016. All of those on your team involved tracking SR&ED activities should take note of these changes. Still not quite sure if you project qualifies for SR&ED tax credit or how these new changes in Ontario’s budget will affect funding for your SR&ED projects. Book your free consult today. There are a host of tax credits and grants your company can claim or apply for if you are partaking in any development or research type activities. Two of the most generous programs offered by the Canadian federal and provincial governments are the Scientific Research and Experimental Research tax credit (SRED, SR&ED or “shred”) and the Industrial Research Assistance program (IRAP). In this post we’ll review IRAP vs SRED and provide some insight on how to benefit from them. If you are in the planning or early stages of your product development life cycle and have a plan on how to commercialize your product, now is the time to apply for your IRAP grant. While more mature projects are welcome to apply for IRAP funding as well, you can maximize your funding by applying early as the IRAP grant, if awarded, will subsidize up to 50% of your project’s costs and is classified as a non re-payable loan or subsidy. While there is no deadline to apply for the IRAP program, it is important to note that funding for the IRAP grant is a budgeted item in the Canadian Federal Budget, hence there is a limit to the funds IRAP can disburse. Hence it’s prudent and may be strategic for you to apply early in the government of Canada’s fiscal year, which runs between April 1st and March 31st for a given year. The SR&ED or “shred” program subsidizes projects in the form of a refundable tax credit and is governed by the CRA. Hence out of pocket expenditures must already have been incurred to benefit from the SR&ED tax credit program. Moreover, the SRED program has a strict 18-month deadline for which an application needs to be filed, in tandem with your corporate tax return, for a given fiscal year. For example, assuming a company with eligible expenditures has a fiscal year end of December 31, 2014 they will have a hard deadline to file for the associated SR&ED tax credits of June 30th 2016. As a rule we tell our clients filing amended claims to plan to file at least 3 months before this deadline to ensure their submissions will be accepted. Understanding the different types of funding schedules is another important step in your pursuit to determine whether the SR&ED or IRAP funding program is right for you. As one can only apply for the SRED tax credit after the fact it is important to know that CRAs service standards are to respond to claimants within 120 calendar days for refundable claims and 365 days for non-refundable claims. If you make an adjustment to your already submitted refundable SR&ED claim, the service standard increases to as long as 240 calendar days. Then there’s each provinces individual delays which can add 30-120 calendar days of additional waiting time to receive the provincial portion of the SRED claim. With such delays it is important to know that you must have the proper funds allocated in your budget to support your SRED eligible activities. IRAP on the other hand will fund your project on a 12 months basis as you submit monthly expense reports to the NRC representative. While this certainly stretches your budget to infuse cash into your company and accelerate your projects, the overhead involved in claiming the program can be a burden for some clients. Finally it is also important to understand just how competitive both the SRED and IRAP programs might be. Firstly the SRED program managed by federal and provincial tax agencies is not subject to a fixed budget. As such all projects that have met the eligibly guideline and that have filed a proper claim will typically receive some kind of funding. While there is no budget per se for the SR&ED program, making it the least competitive of the two CRA has recently instituted tougher policies to thoroughly review applications and throw out poorer claims. IRAP on the other hand has a cap on its funding of approximately 270 million dollars. Moreover, IRAP applications must include commercialization plans along with justification for the work being submitted for subsidy as research and development or leading edge type work, while funding is also subject to project and progress evaluation. However, the benefit of receiving the funds as expenses are incurred are a boon to many Canadian companies.